Probably many of you (not living in Florida, Arizona or California!) feel as we do around this time of the year: Enough with the cold and snow! Despite a good deal of both here in Stockbridge, the gallery has been unusually busy this winter. Winter also gives us some extra time to work on projects which we don’t get around to during the busier summer months. This winter and spring we are busy with website improvements, planning summer exhibitions, mounting new wall installations by Chihuly and Lino and building a new display case upstairs. Before we know it the daffodils will be blooming and it will be time for SOFA-New York! "Starlight Seaform Macchia" – $3000. "Blue Sky Basket Set" – $4000. "Tango Red Persian" – $5000. We also have the 2003 Editions still available as well as a limited number of some Editions from previous years. American Style Magazine has just given us permission to reprint the following article in this letter and on our website. As founder of one of the first studio glass galleries in the country, Kenn Holsten reflects on the joys afforded by art and friendship. Kenn Holsten’s days are an enviable intermingling of art, life and friendship. A former professor of Spanish literature and an accomplished classical guitarist, he first opened Holsten Galleries in Stockbridge, Mass., to help his friends and former wife, Chandra, sell their crafts, offering glass, ceramics, wood, weavings and art jewelry. Today, as the gallery celebrates its 25th anniversary, it is the coalescence of aesthetic object and the bonds to artists and collectors that he cherishes. "It’s absolutely what I enjoy most about this business," Holsten says. "It’s incredible how many wonderful, interesting people we get to be in touch with on a daily basis. The relationships I’ve formed with collectors, with my staff, with artists, have made this an amazing time in my life." Of Holsten Galleries’ long-time gallery co-director Jim Schantz, whom Holsten considers one of his best friends, he says, "We rarely go a day without speaking." And Holsten has, over the years, cultivated close friendships with many gallery artists, traveling throughout the country and abroad to pay visits to their studios and families. On a recent afternoon, Holsten Galleries, off a side street in the village, was packed with visitors. In this tranquil space, strangers chatted with one another amid masterworks by such artists as Dale Chihuly, William Morris, Christopher Ries and Sidney Hutter, wandering among fanciful Ruth Brockman masks, luminescent Sonja Blomdahl vessels and fragile Lino Tagliapietra arabesques. The gallery, says Schantz, seldom shows emerging artists. "We just don’t have the space," adds Holsten, "though we do review portfolios, and we pay attention, when we go to shows, to what is out there." But it wasn’t always like that. In its first year as a multimedia craft gallery, the biggest sale was a $500 work by one of Holsten’s friends. "Prophetically," he says now, "it was a glass piece." Not until 1980, when Holsten opened a second venue in Palm Beach, Fla., did he begin to gain serious attention. "Palm Beach had a cachet that attracted top-name people," Holsten recalls. When the gallery sold out a show of works by Harvey Littleton in 1981, Holsten had found his niche. 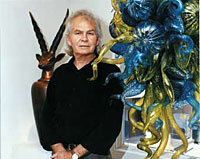 Shows with Chihuly and Tom Patti followed, also with great success. Gradually the gallery began to create a tighter focus, becoming exclusively glass in the late 1980s. Although the Palm Beach branch closed in 1991, the Stockbridge gallery has continued to mount one-man shows of Chihuly’s work every year, even adding a second floor in 1996 to accommodate large wall pieces and heavy chandeliers. Holsten was also the first U.S. gallery, he says, to work with Lino Tagliapietra, the maestro of Venetian glass whom Chihuly calls "perhaps the greatest living glassblower." The gallery first began exhibiting the artist’s lyrical glass concerti in 1984, beginning a relationship Holsten still personally cherishes. "Just looking at Lino’s photograph, you get a sense of who he is," Holsten says fondly, pulling down a photo from his office wall. "He’s sweet, fresh, innocent, warm. And his work is just so incredibly beautiful." Other European artists also have found their way to Holsten’s 2,000-foot space, including Martin Rosol, a native Czech who now lives in the Berkshires, crafting his architectonic sculptures in a private studio near his home. In fact, Holsten observes, "a surprising number of great glass artists live in this area," including Robin Grebe, Berkshires native Patti and Providence-based Steven Weinberg. Under the tutelage of the former professor, who holds a Ph.D. from the University of California at San Diego, clients develop their own connoisseurship, their own taste. "I tell people they need to follow their instincts, not to buy something because they think they should own it or because of the artist’s name," he says. "It’s more valid and more fun to find what’s interesting to the client. Ideally, what they acquire, they’ll acquire simply because they love glass art." These, too, are the rules he himself lives by in selecting artists and pieces for the gallery. "I look for quality," he maintains. Craftsmanship is essential. "Some dealers will talk about the conceptual or social aspect of a work, but that’s not the way I buy art. I go for quality and beauty. Some artists stretch beyond classic appeal, and some are more avant-garde and challenging, basically the criteria are the same." A number of collectors, Holsten says, "go for the ‘wow’ early in their collecting." He tries to guide his clients a bit beyond that, to what he calls "more subtle" work. "Some of our artists require a more educated eye, repeated exposure," he notes. As for himself, Holsten says he loves most glass art "for its simple beauty, the sheer delight of being what it is." Abigail R. Esman is an award-winning essayist, journalist and editor specializing in art and design. Based in New York and Amsterdam, the Netherlands, she also provides publicity and promotion services to artists, galleries, and other arts organizations internationally. This article first appeared in the Winter 2003-04 issue of AmericanStyle magazine. Reprinted with permission. "I always wanted to focus on form, and I was inspired by depictions of sixteenth and seventeenth-century Italian glass that I saw in Old Master paintings, like those by Caravaggio, or in Dutch still lifes." surface of the hot vessel. staff pick of the month. honorary Doctorate degree upon Lino Tagliapietra in May. To view this piece, click here. January-March: Group show of gallery artists including Dale Chihuly, Dorothy Hafner, Sidney Hutter, Marvin Lipofsky, Dante Marioni, William Morris, Stephen Powell, Chrsitopher Ries, Lino Tagliapietra, Lisabeth Sterling and Steven Weinberg. April: Catalog of William Morris works available exclusively through Holsten Galleries. June 2-6: SOFA-NEW YORK: Holsten Galleries will present three one-person exhibitions: Dante Marioni, Stephen Powell and Martin Rosol. At Holsten Galleries, we pride ourselves in the personalized service we offer collectors around the world. No matter what your level of expertise, we can provide you with whatever information you need to make informed choices. The best way to work with us is to give us a call, please see the Contact Us page using the link above.